Current issue and recent issues. (Not on-line until 12 months old, but available by subscription from Athol Books). This was the first in a ten-part series. The link takes you to the first three, and on to the others. Problems 29: Jews as ‘Collateral Damage’ in the Fall of the British Empire. Problems 28: Asocialism Part One: The Muon and the Green Great Dragon. Problems 25 – China: Blue Ants and Dangerous Reds. 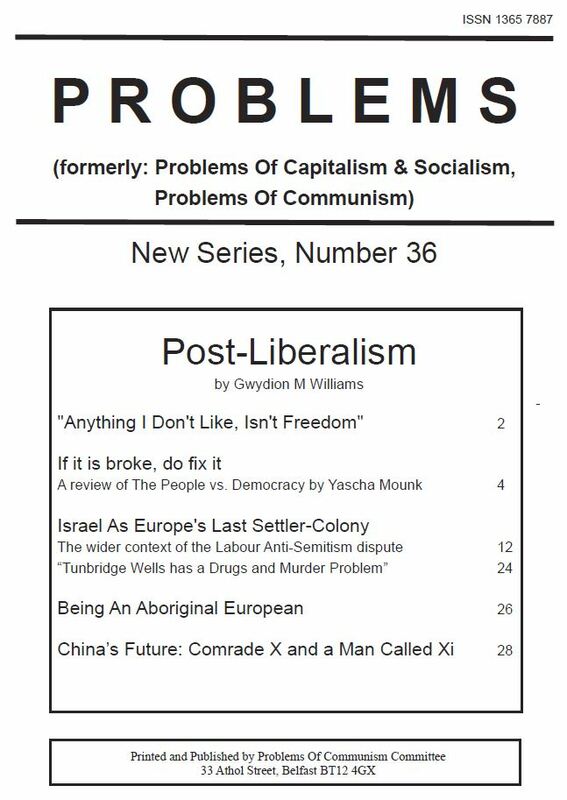 Also available as a PDF, Problems 24 China 1949. Problems 22 – China’s Blue Republic, 1912-49 Stalin: Paradoxes of Power. Problems 19-20 – How Britain Planned World War One, by Pat Walsh. Problems 15-16 – Iraq and International Law. (Republication of articles from the 1990s by Brendan Clifford. Judgements that have stood the test of time. Problems 14 – Why the Anglosphere Can’t Impose Democracy; What We Owe to Vietnam’s General Giap. By Gwydion M. Williams. Problems 13 – Anti-German Propaganda of World War One, by Eamon Dyas.